In a panel discussion with Darryl Hart and Michael Horton, Peter Leithart argued persuasively for a liturgy that includes politics. The prayers of the saints are inherently political. When we pray the Psalms, we pray that God would act on our behalf and defend us from our enemies. When we pray for kings and other leaders, we are bringing the secular into the sacred. These prayers, in turn, shape our understanding of politics. We pray not only as sojourners, but also as rulers of the earth. We pray not only for the world to come, but for the transformation of this present world. The Senate has proposed–through some mini-caucus known as the Senate “Gang of Eight”–an immigration reform bill that has big support from the President, enough that he’s not going to offer his own proposal. The proposal begins with bipartisan support because the group is made up of four Republicans (McCain, Graham, Rubio, and Flake) and four Democrats (Schumer, Durbin, Menendez, and Bennet). Although, it having bipartisan support across Congress is less than promising. The proposal is essentially one that mandates secure borders. Upon securing the border, a trigger is enacted that would give legal status to the approximately 11 million illegals living within the United States currently. The proposal seems to be in opposition to the typical position held by conservatives: secure borders, no amnesty. Conservatives argue that while America is known as a melting pot of civilizations, no melting pot can remain a sovereign nation without protecting its values (such as a common language, religious values–on a very basic, general level, political ideas–typified in the Constitution, and patriotic loyalty. These things can be protected while the melting pot continues in diversity so long as the influx of diversity is restricted enough that the immigrants have time to be assimilated before their views can become the majority view. Liberals, on the other hand, see it more along the lines of a human rights issue. These people came here for the chance to succeed and prosper and that’s what we have to offer, the “American Dream.” We cannot refuse a chance at the dream to someone just because we don’t like the minority background–a violation of human rights. It would be wrong to uproot these people (the 11 million illegal immigrants) from their homes, families, careers, churches, and communities simply because we don’t like the way they got here. They are already part of the melting pot, and doing just fine. Libertarians–while far from a monolithic group–look at it from a slightly different perspective. America is made up of private property and private property holders. The government has no authority over private property and cannot restrict access to it. Thus, if I am a private property owner, I have the right to allow whomever I choose on my property, or to buy my property, or to be employed on my property. This means I can employ, sell to, or rent to anyone, regardless of their point of origin. The 11 million illegal immigrants are illegal based on the arbitrary rules of a government that is violating my private property rights when it makes such rules. The rule is, by definition, an illegal, unconstitutional, and unjust rule, and therefore should be reformed. What needs to be considered in analyzing the “Gang of Eight’s” proposal is not whether the Democratic President Obama likes it, nor whether it was written by Democrats, Republicans, or both. It is not necessary to know whether FoxNews agrees with it or CNN or MSNBC or the Huffington Post or Drudge Report. What needs to be examined are the philosophical, theological, and political underpinnings of why one is in favor of or opposed to immigration. For example, if you would normally take the conservative view, would you consistently apply those same arguments to the Church? Would you try to justify refusing Church membership to a large group of Chinese converts because they language, religious views, and values they would bring to your local congregation might overpower the values of the congregation currently? If you would normally take the liberal view, would you consistently apply those same arguments to your own home? If someone just moved in and began homesteading on your property, would you refuse to have them forcibly removed on the basis of basic human rights? If you would normally take the libertarian view, would you make no room for restricting the borders for concerns of national security? Should the borders at least be patrolled, if not to stop immigrants from access to private property holders, then at least to be surveyed for potential threats to national security (suitcase nukes, dirty bombs, chemical weapons, etc.)? Finally, we must ask questions about the unintended consequences of our reform. If this reform basically states that we are going to start securing our borders, and once we do any and all illegal immigrants currently within our borders will become legal, then aren’t we basically offering a huge carrot for a mad rush of illegal immigration to push across the borders now, before they become secure, in order to receive that amnesty? And, if we are, does it matter? Should we even be trying to stop them by securing the borders anyway? The Bible is silent on securing the border or restricting immigration. It does, however, teach the assimilation of strangers into the culture of the nation, “You shall treat the stranger who sojourns with you as the native among you, and you shall love him as yourself, for you were strangers in the land of Egypt: I am the Lord your God” (Lev 19:34). “It is very difficult to decide in particular cases when it is right for a Christian nation to go to war…But the following general principles are very plain and very certain: — War is an incalculable evil, because of the lives it destroys, the misery it occasions, and the moral degradation it infallibly works on all sides…In every war one party at least must be in the wrong, involved in the tremendous guilt of unjustifiable war, and in the vast majority of cases both parties are in the wrong. No plea of honour, glory or aggrandizement, policy or profit, can excuse, much less justify, war; nothing short of necessity to the end of the preservation of national existence. That war be the only means to avert it. By Special Contributing Kuyperian Author, R.C. Sproul Jr. It is rather fashionable, in certain Reformed circles, to bemoan the church’s historical ignorance. We don’t know our Bibles, nor our creeds, nor our fathers. In slightly smaller Reformed circles we likewise bemoan our anemic understanding of the church. We live in the age of the para-church, the house church, the self-authenticating, social network framed country club church. The weaknesses we complain about are likely worse than we think, though likely not for the reasons that we think. I fear we complain about these weaknesses not because they are dangerous and dishonoring to our Lord, but because they make us look bad. If all evangelicals were as well educated, thoughtful, historically grounded and ecclesiastically connected as we are, we seem to think, the world would stop thinking of us as ignorant, backwoods fundamentalists. All error, in the end, is an offence against the true and living God, and against His image bearers. The danger of our folly is when it keeps us from loving God with all our heart, mind, soul and strength, and loving our neighbor as ourselves. When we do not think God’s thoughts after Him, when we are not informed by our fathers in the faith we do not end up believing nothing, but instead believe the wisdom of the world. We end up tossed to and fro by every wind of doctrine. Consider, for instance, just war. Though precious few in the church are aware of this, over the centuries the church wrestled with a rather important moral question, under what circumstances, if any, may a state wage war. Saint Augustine wrote clearly on this, positing a list of criteria, each of which needs to be met to justify war from a biblical perspective. Proportionality, win-ability were two requirements, but none stood taller than the first- we may only wage war after we have been attacked. Not threatened, not aggravated, but attacked. All just war is defensive war. Sadly, because this is forgotten within the evangelical church we have, by and large, supported numerous unjust wars over the past fifty years. Because we are more concerned with being “conservative” than we are with being Christian we have waved our flags, repeated our jingo-isms, even celebrated victories over nations that did us no harm. We have treated the deliberate exposing of our own soldiers to danger, and the deliberate killing of “enemy” soldiers as mere matters of policy. The horror, however, isn’t that we have been wrong. The horror is that soldiers, and civilians have died. Mothers have lost sons, children fathers. And they have died fighting when and where they should not have fought. They died not heroes but tragedies. We stand guilty; there is blood on our hands. It is never a safe thing to try to read providence. God’s ways are not our ways. But is it at least possible that the church finds itself horrified (at least I hope horrified) at the prospect of our daughters waging war, that we face this great evil in our day because we have embraced the waging of unjust wars by others? Could it be they will come for our daughters for their imperial wars because we gave them our sons for imperial wars? Could it be that our callousness over the death of our soldiers will bring forth the death of our daughters? That we are becoming the victims of injustice because we have cheered injustice on around the globe? CS Lewis said “Wars are ugly when women fight.” The truth is, all wars are ugly. And on this issue, in this day, so is the bride of Christ. G.K. Chesterton once observed that the business of conservatives is to prevent mistakes from ever being corrected. The renown writer of Orthodoxy speaks from the grave. Conservatism as a philosophical system is rather schizophrenic in our day. It lacks a unified agenda, and therefore cannot accurately pinpoint its errors. 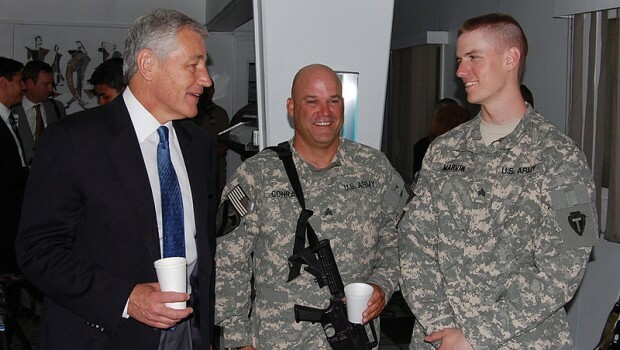 Chuck Hagel endured the systematic chastisement from the left and from the right. The right believed he was too casual about the terrorist threats and not Zionistic enough in his allegiance. The left bombarded him about his past statements opposing homosexuality and abortion. Hagel won the day, but is still recovering from the Neo-Conservative war drums musicalizing against his nomination. Hagel is the type of conservative Conservatives should seek to emulate: cautious in his foreign policy and strong in his moral convictions. His moral convictions would also entail respect for the much debated second amendment, because defending my wife and children is a moral issue. So Obama was right: there is still something sacred about sticking to our guns and religion. Andrew Bacevich in his fascinating piece in the Jan/Feb edition of The American Conservative echoes some of these thoughts. Andrew alerted me some years ago to the dangers of Imperialism. In his piece, he says we need a little more of Flannery O’Connor and less of Ayn Rand. He offers an appetizing reason to sprinkle O’Connor into the formation of an authentic Conservative Party. The Flannery O’Connor flavor includes a healthy dose of community living, which is “our best hope of enjoying a meaningful earthly existence.” Lots of cheers there! Also, the agenda may need to be salted with something more than fancy-dressed charlatans “peddling the latest Big Idea That Explains Everything.” Karl Rove, say good-bye. Neo-Conservatives proposing a world police State, say good-bye. You are just not conservative enough for us. We can’t put our house in order if we are spending our time and money in fixing other people’s houses. On the moral side of things, Bacevich says that our big problem is the “collapse of heterosexual marriage as an enduring partnership…” Let’s not overlook our mistakes and blame it on their moral failure. Jesus had a few things to say to that line of reasoning. Chesterton argued that conservatives need to conserve something. But the problem is conservatives are having a hard time defining what they ought to conserve. In short, a robust conservative agenda entails the recovery of a moral and transcendent view of life and a profound commitment to a community where Chesterton and O’Connor would be welcomed guests of honor. Rich Lusk deals with this in The Church-Friendly Family. You should get yourself a copy…go ahead, I’ll wait. Jan. 22 marks the 40th anniversary of Roe v. Wade, a decision that has taken the lives of over 50 million children. A decision the Church has been actively seeking to dismantle. To help us understand this issue, I have compiled a small list of the best pro-life sermons against the works of darkness and the abortion industry. I pray that this will encourage Pastors to preach against abortion this Sunday.